At Hodgson Light and Log, we sell only the best patio umbrellas in Kalamazoo from our supplier Treasure Garden. Treasure Garden has always been a leader in umbrella design and technology. Over the years, we have had the opportunity to work with many manufacturers of patio umbrellas and have not found one that makes umbrellas that are higher quality, more beautiful, more functional, and easy to operate than Treasure Garden. Enjoy the outdoors while protecting yourself, friends, and family from the heat and harmful rays with one of our amazing patio umbrellas. Our cantilever shade umbrellas are available in 13’ or 11’ designs. These umbrellas are not only extraordinarily functional but also bold and gorgeous. A freestanding pole holds up the umbrella creating a unique look that provides just the right amount of shade for your and your guests to enjoy. 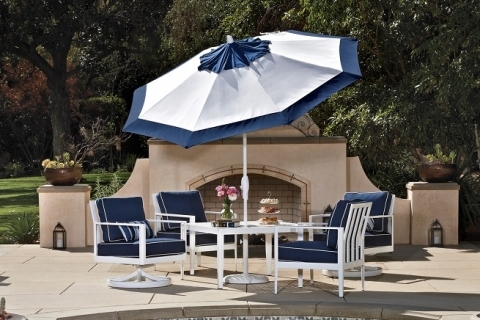 Our collar tilt patio umbrellas are available in 11’ and 9’. Collar tilt allow the top of the umbrellas to be tilted without needing to be able to reach all the way to the top in order to do so. The collar tilt patio umbrella features a button near the crank that allows you to tilt it easily with no struggle. Market patio umbrellas are the most traditional type of shade umbrellas. These umbrellas come in aluminum or wood and can include many different types of mechanisms that include collar tilts and cranks. At Hodgson Light and Log, we have the best selection of patio umbrellas in Kalamazoo. Experience shade with style with a cantilever, collar tilt, or market umbrella by Treasure Island this spring and summer. If you have any questions or would like to take a look at our patio umbrellas, come down to our store today!